‘The Troshers’ is the more relaxed side of the club. The group started in September 1990 when Mary Dent started a beginners’ group, with a view to supplying the band with new members. Several past and present members of band did start with The Troshers. Since then the group has evolved an identity of it own. Mary continues to direct the group which consists of players of mixed ability – from an ex-professional to an nonagenarian busker. Numbers have fluctuated over the 20 years, but there is now a core of about 12 regular players. They have been helped out by two of the band members on occasions. In the early days the group and individual players took part in Music Festivals. In 2001 they achieved an honours certificate (the highest award) in the Broadland Music Festival. More recently they have concentrated on entertaining rather than competing. The music played is arranged in 3 to 5 parts which includes a bass played on a special bass instrument. The repertoire consists of well known songs with the occasional light classical piece, march or tango. They play at clubs and homes, mainly in the afternoons and are always well received. A recent innovation has been the preparation by Pamela Garrett of illustrated folders with the words to the songs. Pamela has also been acting as deputy conductor. The oldest member is currently a nonagenarian and the youngest in her forties. 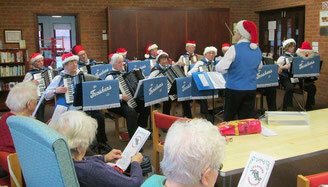 One member started to learn music and the accordion after retirement. The name Troshers comes from the local dialect verb to Trosh, which means to try – as in ‘Keep yew a’troshin’ bor’ (It can also mean to thresh or to scoff food). We have space in the practice room at Heartsease Methodist Church in Norwich for several more players so if you have keyboard experience and can read music come and join us. Some instruments are available for loan. In particular we would welcome someone who can read bass music and would come and play our bass instrument.